In our fifth decade in the roofing industry, we take great pride in the people and professionalism that drive CentiMark to new levels of success and excellence in roofing and flooring. Winter – Spring – Summer – Fall: How the changing seasons affect your roof. As we change seasons, it is important to understand the impact that weather has on your building’s roof. In the fall, your roof can get covered in leaves. Once the leaves fall, it is important that gutters and downspouts are free of debris and flowing properly. Additionally, if your area endured any significant storms, and you didn’t have your roof inspected after the storms, now is a good time. The inspection will identify damage and needed repairs, allowing you to get them fixed before winter. Puerto Rico was hit hard in 2017 from multiple hurricanes (Irma and Maria). Unfortunately, the Ardent Mills facility in Puerto Rico sustained damage to the roof, including the grain and flour silos. Because of the sensitive nature of food processing, it was imperative they find a quick solution that would not contaminate any product. Ardent Mills turned to their national roofing partner, CentiMark. ❄️Winter is here. With that comes heavy snow and ice that can cause problems on your roof. Learn what you can do to prevent them by reading our snow removal infographic. Roof coatings are one of the keys to help extend the life of any roof system. A building may need a new roof; but, coatings may be a viable option to extend the roof for five to ten years, along with the addition of a roof warranty for those years. Technology is being used in CentiMark roofing services to benefit customers in a number of ways. From infrared thermal imaging used to detect moisture captured within a roof to unmanned aircraft (drones) used to enhance inspections. The frequency of torrential rains and microbursts in much of the United States has increased dramatically since 1958, according to the U.S. National Climate Assessment’s “Climate Change Impacts in the United States”1 which puts large amounts of rain on the roof in very short periods of time. The impact of all this heavy rainfall on roofs can, has been and will continue to be disastrous, especially when roof drainage systems fail. Your decision to choose a roofing contractor is just as important as selecting the products that will end up on your roof. This can include everything from HVAC equipment, exhaust fans, even satellite dishes may need to be installed. Hurricane Matthew recently reminded all of us in the roofing industry that weather and environmental conditions can have a huge effect on your roof. There are many far more subtle conditions that exist and can cause detrimental conditions leading to premature roof failure: wind, rain, snow, freezing temperatures and heat. Each of these factors has a different effect on your roof and manifests itself in different ways. Understanding the effects of each condition and identifying the symptoms they reveal is critical to making the best roofing decisions and extending the life of your roofing asset. When it comes to rooftop pipe supports, building owners need to think about the long term. All too often during a roofing or re-roofing project, support for the rooftop pipes are not considered until deep into the project. Quick fix options may seem like an economical solution, but may cost building owners dearly in the long run. As a building owner or manager, you know how important a proper Preventative Maintenance Program can be for your roof. Every building is unique - CentiMark can help structure a customized program designed specifically to protect your roof with consideration of your budget. Are you asking yourself if you should repair or replace your building’s roof? This is a question many building owners struggle with. The answer varies depending on each situation. Understanding the type of roof assembly and the existing condition of your roof is important to make a good decision. It’s amazing to see the number of buyers who purchase roof systems with the primary consideration being the type of roof system that will be installed. So little time is spent on selecting the contractor installing the roof system! Long, Hot Summer - Can the Sun Damage My Roof? Can the sun damage my roof? That’s an interesting and complex question. Do you know that there are both beneficial and detrimental aspects of sunlight and its effect on your roof? The roof’s edge metal system – fascia or coping – acts as the roof’s first line of defense. The edge metal system ensures the integrity of the entire roofing system when Mother Nature has other ideas. Therefore, it’s important to get the very best edge metal system possible and not compromise on quality or performance. 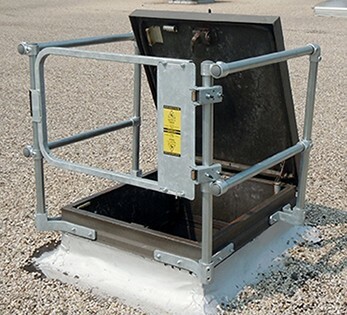 What are Roof Access Hatches? Many roofs, especially low sloped roofs, are accessed via a fixed ladder or stairway leading to a roof hatch or scuttle. Most hatches are equipped with a hinged lid that has pistons or springs to assist in opening the lid along with a locking mechanism to keep it open. These fixed ladders and hatchways make climbing onto a roof more convenient than using an extension ladder. Proper care and preventative maintenance of your roof can prolong the service life past the intended term of the warranty. Here are five ways to extend the life of your roof. Mother Nature can cause havoc to roofs. Wind uplift forces cause roof damage that can be readily apparent as well as cause damage undetectable to the untrained eye. That’s why damage from wind requires a professional roofer to assess the immediate effects as well as potential or longer term problems.